Provide comfort for the family of Andrew Connolly with a meaningful gesture of sympathy. CONNOLLY, Andrew J. of Winchester passed away peacefully on March 21, 2019. Beloved husband of the late Dolores “Dee” (Potzman) Connolly. Loving father of Dennis W. and his wife Lynne Humenik-Connolly of Jamestown, TN, Debra M. Laliberte and her husband Sean Czarniecki of Billerica, Thomas A. of Winchester, Richard J. of Winchester, and the late Stephen M. Connolly. Cherished grandfather of John and Jennifer Connolly, Alicia DiMola and her husband Joseph, Andrew J. Laliberte, Robin Czarniecki and his great grandson Antonio Connolly. Dear brother of the late Mary Wylie. Also survived by many loving nieces and nephews. 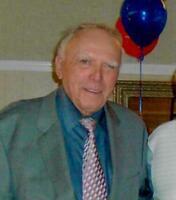 Family and friends are invited to a visitation at the Lane Funeral Home, 760 Main St. (Rte. 38) WINCHESTER on Thursday March 28th from 10am-2pm. Private Burial will be held at a later date. Andy was born and raised in Winchester and was a dedicated employee for the Town of Winchester for 46 years retiring as the Foreman of the Transfer Station. He loved spending time with his family, especially his grandchildren. He could often be found cheering on local sports teams of all types. Andy was an avid deep-sea fisherman and loved to fish off the coast of Gloucester as often as he could. His friendly way and big smile will be greatly missed around town including his friends at Dunkin Donuts and Town Pantry. In lieu of flowers donations in Andy’s memory may be made to the Winchester Sports Fdtn., PO Box 493, Winchester, MA 01890. Late Veteran US Navy and lifelong member of the Knights of Columbus. Amy Keller sent flowers to the family of Andrew J. "Andy" Connolly. Heartfelt Sympathies Store purchased the Serenity Wreath for the family of Andrew Connolly.